The MOVIE - Down the Colorado River in a Rowboat. 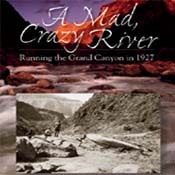 When Clyde Eddy undertook the expedition that is the subject of A Mad, Crazy River, part of the plan was to film his travels through the Grand Canyon. When Avanyu Publishing located the original edition of this book, they also discovered an original copy of Eddy's Kodak Cinegraph film that was made along the voyage. The film is titled Down the Colorado River in a Rowboat. The film is dated 1927, is in black and white with no sound but subtitles, and is approximately 8 minutes long. Avanyu Publishing has had the original film digitally remastered and the DVD provide imagery that is unique.